Yes, beautiful! The images come around and around like the moon itself. Well done! Excellent!! If you can find the right musician, this would make a really good song. Your poem was so lovely. Great thoughts! Thanks for sharing! Thank you for this inspiring piece!!!!!! You words are brilliant and leave me wanting more. Thank you I feel like I’m right there in the poem and feel every word. Keep it up. Words are something we live by everyday and it’s nice to see that someone knows how to use them. and I am glad the moon can’t see tonight. Awesome photos, perfect for the poetry. Beautifully stirring! Happy New Year!! Lovely, lovely web design in addition to words! Thoughful and beautiful. Great image too! Beautiful poetry Yaz.. wishing you a wonderful 2016 and beyond.. May it be filled with many Blessings. Thanks for sharing such a great photography that inspired my night. 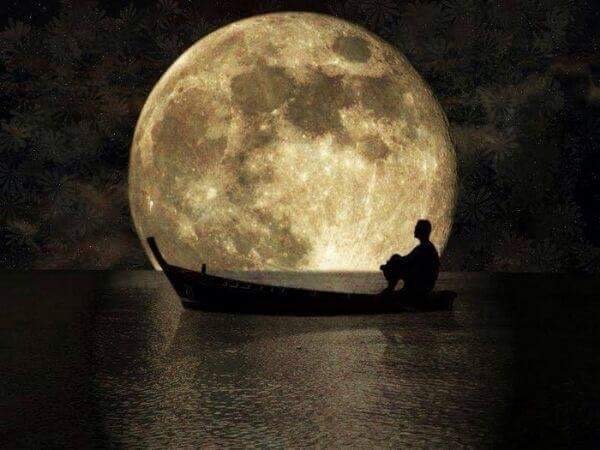 I love your graphic of the boat and man against the backdrop of the moon. A sad, contemplative poem and a beautiful one as well. My moon (if I can claim it) is also a ‘she’ … funny how our gender differs. 🙂 I need to write more poems … thanks for the inspiration. Beautiful poem. That photograph goes well with it. You have a way of invoking potent emotion. Love the image the words it inspires. Thank you for sharing. Great poem! I loved it! Thanks for stopping by my little corner of WordPress too!